The Strong Museum of Play has accepted a massive Atari collection from two California collectors. The Strong Museum of Play in Rochester, New York has announced the acquisition of over 2,000 documents - drawings, photographs, mock-ups, proofs, and other materials - that chronicle the design and creation of Atari game packaging and user manuals in the '70s and '80's from a pair of California collectors. 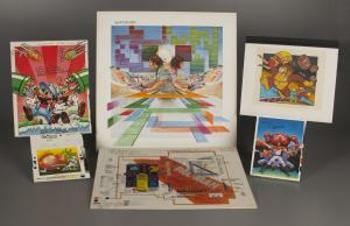 Included in the collection are materials that "demonstrate how Atari created the manuals that explained video game play to millions of early video game players," documents that chronicle Atari's transition to arcade-style packaging, documents that show how the company worked with Nintendo to design the packaging for Mario Bros., and more. "Atari is one of the most important companies in the history of electronic games," said Jeremy Saucier, assistant director of The Strong's International Center for the History of Electronic Games, in a press release. "This artwork illustrates how Atari created some of its iconic video game packaging during an era when video games became a staple of daily play." "Packages protect and preserve, but they are also expressive. Atari's vibrant video game packaging often bridged the gap between the fantastic game worlds that players imagined themselves entering and the abstract and blocky graphics on their video screens," Saucier said. "This artwork and documentation, which add to The Strong's exceptional collection of other materials related to Atari, help us better understand how a gaming pioneer packaged and sold its products to a new video game playing public." The collection will be available to researchers for review, as well as part of future displays. The Strong is also home to the World Video Game Hall of Fame, which announced its inaugural class - Pong, Pac-Man, Tetris, Super Mario Bros., DOOM, and World of Warcraft - in June. I don't have anything that old, but still, when I were a lad the manuals used to mean something, they had chunks of back story for the world and characters. Plus they had big cardboard boxes to hold just a cd box. Let them show more detail on the art an game description. Fantastic that these things will be preserved.